As far as foot controls are concerned, the use of wireless technology offers some obvious advantages; the units can be positioned at will and there are no cables to trip over or restrict movement. 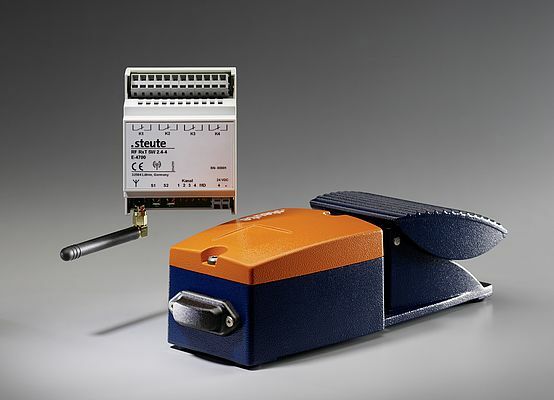 The RF GFI/ GFIS series from steute offer these advantages by using a new wireless standard developed by the company. Originally developed for medical equipment, this wireless standard uses the license free 2.4 GHz band and is not affected by any interference from other radio networks. The radio signals are evaluated by a compact receiver unit which can be installed in the switching cabinet. Housed in an all metal enclosure that withstands mechanical tear and wear, the ergonomically shaped GFI series feature low pedals and high stability.